The CTM HS-320 has a infinite adjustable tiller with a full light kit. The HS-320 is also available with a locking cargo case that replaces the front basket. Learn more here. The CTM HS-320 comes standard with horn, Forward and reverse as well as a highly adjustable speed dial living the user full control over the speed. Virtually adjustable tiller allows a user to position the tiller at any point that is comfortable for them. Automotive quality headlight once again providing a extra level of safety allow the user to see as well as be seen. A Memory Foam seat with two extra layers of padding and fully adjustable flip back arm rest. The CTM HS-320 comes standard with rear anti tip wheels for added safety and stability. Would you prefer a enclosed cargo carrier rather then a wire basket.? If so click here..! One Full Year In Home Service Limited Warranty. Your new scooter comes with a full One Year In Home Service Warranty. Stop worrying about who would repair your scooter or how you would get your scooter to them. This warranty has you covered! We will send a trained professional repair technician directly to your home in the event your scooter should need repair. We cover the entire United States. The map below indicates the location of our service affiliates. Personalize your new scooter. Its Free & Easy, Simply select letter of font style below you like and enter it in the order form along with the name or text you would like to use to personalize your new scooter. We include a Oxygen Tank Holder Free with the purchase of this scooter. 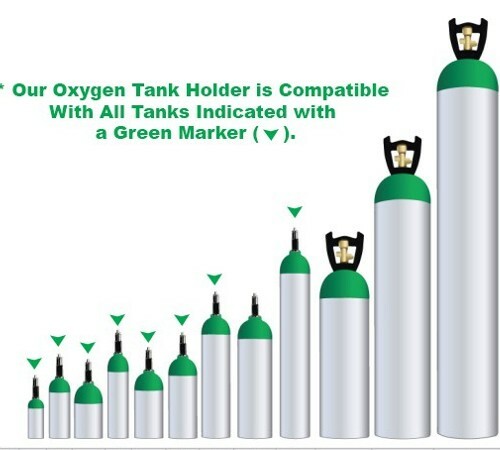 This Oxygen Tank Holder will hold most any size tank. The chart shown on the left indicates with a red arrow all tank sizes this tank holder will accommodate. Also included free are all items listed below. (Optional) Personalize It By Entering Information Below, Otherwise Leave Blank. !